All of our policies exceed the International Experience Canada (IEC) requirements. Our Premier policy covers you for up to £10m for hospitalisation, medical and repatriation expenses; up to £5m for our standard policy; and up to £2m for our budget policy. All our policies also include emergency dental treatment to relieve pain and suffering (limited to £350). We have 4 different options for our winter sports add-on. You can include cover for 14, 28 or 56 days of consecutive or non-consecutive winter sports activities, or you can include cover for the entire duration of your policy with our Unlimited add-on. If you feel homesick at any time, so long as your policy duration is more than 4 months, you can pop home to see family and friends at any time, however many times you choose. Covers stops as soon as you arrive home and starts again as soon as you depart. Decide Canada’s not for you, and want to return earlier than your full period of insurance? Other insurers will tell you to wave goodbye to your money, but Big Cat lets you claim a partial premium refund for the unused time you didn’t stay in Canada. Unlike most other Insurers we don't require you purchase a return airline ticket. Our IEC policy allows stays for up to 2 years, so presenting IEC insurance for 2 years at the Canadian border on entry means that you can receive the maximum 2 year visa. Show up with just 6 months insurance and you'll only get a visa for 6 months! For British citizens aged between 18 and 30 years you can travel to Canada for a working holiday under the IEC visa programme. This will allow you to find temporary paid employment to help pay for your trip (up to 24 months). That means, for example, you could work in a ski resort in Banff, a restaurant in Quebec, or gain work experience at a business in Toronto. However a strict requirement for those visiting Canada on an IEC visa is that you must have medical insurance for the entire duration of your stay. You may need to present evidence of this insurance to the border services officer on arrival in Canada otherwise you might not be admitted into the country. The IEC insurance needs to cover you for hospitalisation, health care and (if necessary) repatriation to your home country. Remember, you must ensure that your IEC insurance policy covers the entire period of your stay in Canada, otherwise your work permit will expire at the same time as your insurance. Emergency Dental Cover up to £350. Cover duration of up to 2 years. Policy Extensions whilst still travelling. You can claim whilst Travelling. Can I come home during my policy? Home visits are allowed if your policy duration is 4 months or more. There are no limits, you can come home as many times as you like, for as long as you like. Decide Canada’s not for you, and want to return earlier than your full period of insurance? Other insurers will tell you to wave goodbye to your money, but Big Cat lets you claim a partial premium refund for the unused time you didn’t stay in Canada. How does the EARLY RETURN REFUND work? Let’s say you buy a 24 month policy to cover your time in Canada. But after nine months, you decide that Canada’s not for you, and you want to return home. You may have invested a substantial amount for your 24 month Big Cat policy, most of which you’ll now no longer need. Unlike most insurers, Big Cat is happy to offer you a partial refund on the redundant portion of your insurance as a fair’s fair consolation. How does Big Cat calculate the amount of EARLY RETURN REFUND? We take the length of time of the original policy and subtract the actual amount of time you have used, and pay out the difference, deducting a £50 Cancellation Charge. Are there other conditions that apply to my EARLY RETURN REFUND? We are not able to offer refunds to cover the first 6 months of the policy. No refund can be given on a policy where a claim has been made prior to the cancellation of your Big Cat policy. You must be back in your home country and notify us by email of your wish to cancel the policy within 14 days of your arrival. Can you give an example of how much I could receive back in my EARLY RETURN REFUND? Say you took out a 24 month budget IEC policy costing £457.50, then you wish to cancel the policy after 9 months. Our 9 month policy costs £242.89. So we deduct £242.89 from £457.50 = £214.61. Then we apply the £50 Cancellation Charge, refunding you a total of £164.61. What Medical Expenses are covered by my Travel Insurance? 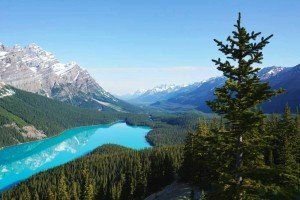 Fancy a trip to the States during your Canadian stay? With our policy there's no problem taking a trip across the border. You'll still be covered to visit New York, L.A., Las Vegas, Seattle or any other stateside destination. If you decide not to stay in Canada and would like to travel elsewhere, that's no problem. You will still cover you for travel to the rest of the world for the duration of the policy.